Northern Ireland's Rory McIlroy had a dismal day on the greens at Ballyliffin. Press Eye - Belfast - Northern Ireland - 4th July 2018 Dubai Duty Free Irish Open hosted by the Rory Foundation at Ballyliffin Golf Club, Co Donegal, Ireland. Graeme McDowell takes part in the Pro-Am at Ballyliffin. Photo by Kelvin Boyes / Press Eye. Tournament host Rory McIlroy is aiming for his second Irish Open success. 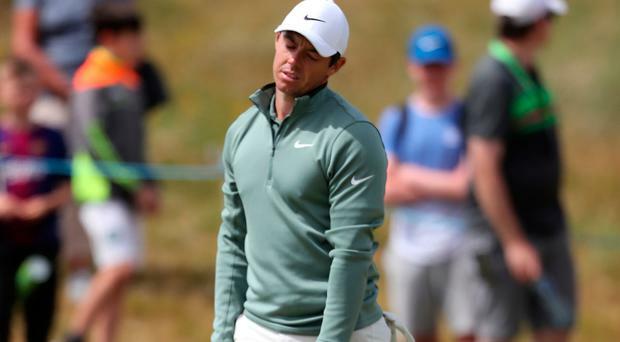 Rory McIlroy's putting problems kept him behind the leaders on the opening day of the Irish Open despite a fabulous round of golf tee to green. The Holywood man carded a two under par round of 70, three back of leader Ryan Fox. But, as he missed seven putts around 10 foot or under, it was a display of golf that was at very minimum good enough to see him into the outright lead. A good putter could have been closer to 59 than 69 with Rory's game tee to green. The leading Irishman is Padraig Harrington, who finished up in a group at -4 with an impressively controlled morning round. By Roy Curtis for the Irish Independent Rory McIlroy might as well have serrated the edge of an old lob wedge and thrust it into Paul McGinley's ribcage. By Gareth Hanna Rory McIlroy has confirmed that he will sit out this season's Irish Open. By Brian Keogh Darren Clarke begins his PGA Tour Champions career in Seattle on Friday but he's already looking to 2020 and the Dubai Duty Free Irish Open. By Adam McKendry Golf is a game of millimetres. So said someone to me as we were on the 18th fairway preparing for the play-off at the Irish Open, and boy was he right.